St George's Church in Gateshead was built to the design of John Piper and consecrated in 1897. It is a splendidly preserved Grade I Listed Building which is favourably reviewed in the Durham section of N. Pevsner's "Buildings of England". The organ is a fine example of the culmination in the thinking of the great 19th century English organ builder "Father" Henry Willis, though in fact the organ was ordered from the Willis firm soon after the founder's death in February 1901. 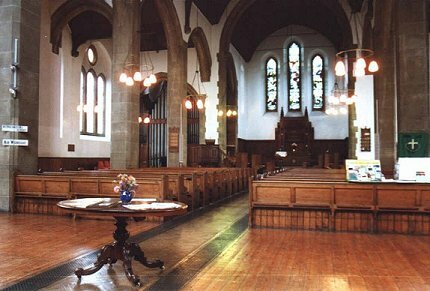 There is a much earlier (1876; 2m) "Father" Willis instrument at St Helen's, Low Fell, down the road, which (perhaps with the Durham Cathedral organ) seems to have been influential with those choosing a builder for the organ in the new church of St.George in the then southern fringe of an expanding Gateshead.. The Willis records show that alternative estimates for different qualities of organ, to standard designs, were first provided by the firm in June 1900. 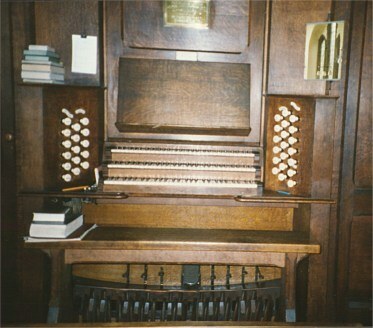 However, with the whole organ being paid for by a single donor, it was a bespoke "high class pneumatic organ" costing c.£1500 (the Ophicleide was an extra) that was ordered in July 1901, constructed at the Willis works under the direction of his son Henry Willis II, and delivered, installed and voiced between November 1st 1901 and December 10th 1901. The Willis II latin motto can be seen on the organ label. The organ has been lovingly nurtured down the years; and remains a superb example of "imperial" organ building at its best, and provides fine testament to the skills of the mature Willis firm. The tubular-pneumatic action and specification are unaltered from when it was built and the tone is extraordinarily powerful, but refined, making it ideal for both liturgical and recital purposes. It is highly regarded as an exceptional treasure by internationally renowned visiting organists and has attracted glowing comments from the many Cathedral and other organists who have played it. It has taken 3 months' work by Harrison & Harrison Ltd of Durham, so at Easter 2003 the organ is now fully restored to first class condition, involving re-leathering of the 6 bellows (which have given superb service for nearly 100 years but badly needed refurbishment), thorough cleaning (following an arson attack on another part of the church), and careful re-adjustment. The action is of a particularly effective experimental "Father" Willis floating lever design, Patent No.15,182, using a tubular-pneumatic compressed air system, producing instantaneous attack, reiteration, and staccato effects. These are fully responded to by the perfect articulation of the pipes, the tones of which provide variety in quality and power. When the time came that I had the privilege of advising on the restoration of the organ at St. George's there were some people suggesting thoroughly modernising the organ, with electric action and additions to the specification. It was clear to me that this would be an act of vandalism. The only alterations which were made were the installation of a new blowing plant and of a balanced Swell pedal. Otherwise the organ was restored without alteration, as near as was possible to "as new" condition. It is interesting that present-day opinion, after another twelve years, would emphatically confirm what was done - indeed today one might have retained the lever swell on antiquarian grounds (though I am sure most organists are glad for convenience sake that we did not. The magnificent construction of the tubular pneumatic action, with, for instance, massive trackers connecting the light and heavy pressure sections of the great sound-board, works as well and responsively as on the day it was made - and a lot better than some more "modern" actions. On paper, the stop-specification could look a little dull, especially that of the swell with no Mixture. Repeatedly I have said to visiting organists "Wait till you hear it". The choruses are not what would be specified today - yet this is one of the most thrilling organs I know for playing Bach and his contemporaries, and the contrapuntal lines sing out clearly and vigorously. 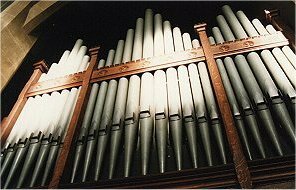 Writing nearly 30 years ago the late Dr. W. L. Sumner, the foremost British organ expert of the time, said "A Father Willis organ is part of our artistic heritage; it should be jealously preserved". During those thirty years a number of these organs have been destroyed, or altered in detrimental ways. We may be thankful that St. George's Willis is appreciated and well cared for by those who have the charge of it.